The China Shipbuilding and Offshore International Company launched the Nigerian Navy’s first of two P-18N offshore patrol vessels on Monday. The launch ceremony took place at Wuchang Shipyard in Wuhan, China, and was attended by numerous Nigerian dignitaries, including Nigeria’s First Lady, Patience Faka Jonathan. She said her husband Goodluck Jonathan’s administration is committed to recapitalising the Nigerian naval fleet to enable it to address various maritime security challenges, IHS Janes reports. The vessel was assigned the pennant number F91 (the pennant number F90 is assigned to the NNS Thunder, an ex-US Coast Guard cutter). The offshore patrol vessel’s launched ceremony also marked the hull formation ceremony of the second vessel, F92. Only the first offshore patrol vessel (OPV) will be built entirely in China as between 50 and 70% of the second ship will be constructed in Nigeria in an effort to enhance local shipbuilding capability and provide technology transfer. Delivery of F91 is expected in the middle of this year and the second vessels is also expected to arrive sometime in 2014, and be completed either late this year or early 2015. China Shipbuilding and Offshore International Company (CSOC) has also signed a contract to upgrade the Nigerian Naval Shipyard in Port Harcourt so that it can build OPVs and maintain vessels up to 10 000 dwt. Upgrades to the dockyard include a new jetty, a new dry dock and other additions. Nigeria ordered the two Chinese OPVs in April 2012 and construction began that October. 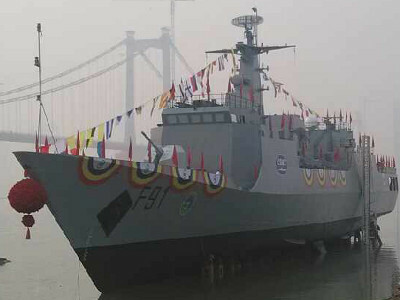 The vessels are based on the Type 056 corvette in service with the People’s Liberation Army Navy. The vessels are 95 metres long, with a draft of 3.5 metres. They are powered by two MTU 20V 4000M diesel engines, giving a speed of 21 knots, and are armed with one 76 mm and two 30 mm guns. Crew complement will be 70 sailors and endurance 20 days. They will be able to carry and support a helicopter off a rear deck. The Nigerian Navy announced that the vessels would mainly to be used for maritime surveillance, patrol and response tasks. Other roles of the vessels would be protection of offshore assets, Exclusive Economic Zone (EEZ) patrol and surveillance, search and rescue and oil spill control.